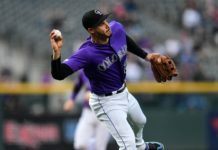 Pat Valakia drove in three runs and Jon Gray pitched 7.0 innings to lead the Colorado Rockies past the Philadelphia Phillies, 8-5, on Saturday night at Coors Field. 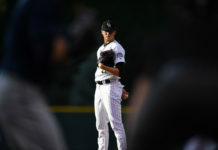 The win ensured Colorado’s third straight series victory and moved them into the top spot in the National League Wild Card. The loss added to Philadelphia’s MLB-worst record. Valaika had a pair of hits and three RBIs, including a two-run home run in the bottom of the third inning off Phillies starter Nick Pivetta (4-7, 5.89 ERA). All three of Valaika’s RBIs came with two outs. Gerardo Parra had three hits and two RBIs. He got the scoring started with a bases loaded single in the first inning. 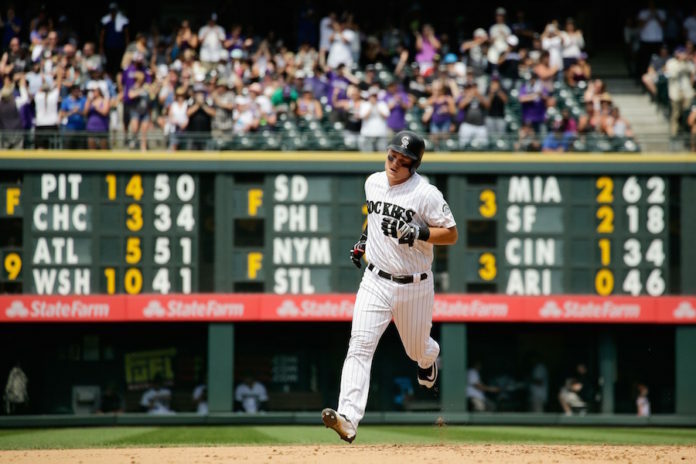 Mark Reynolds, Jonathan Lucroy and Carlos Gonzalez also drove in a run apiece in the victory. Colorado put up five runs in the first inning to stake Gray an early lead. Gray (4-2, 4.94) did his part, giving manager Bud Black seven strong innings to earn the victory. The right-hander allowed only one run on six hits and a walk, striking out four. Zac Rosscup struggled in the eighth, recording only one out and allowing a three-run home run by Daniel Nava. Adam Ottavino allowed one hit in relief of Rosscup, but worked out of the inning without any further damage. Former Phillie Pat Neshek gave up a run in the bottom of the ninth on a pair of singles.